by appointment (email: ) or 6230 9630. Entry is Free. Donations will assist the Friends of the Hall School Museum. Easy parking and disability access. In the 1860's and 1870's—long before the suburbs came, 'selectors' chose blocks of land to build a home and a farm, and gradually, a community. 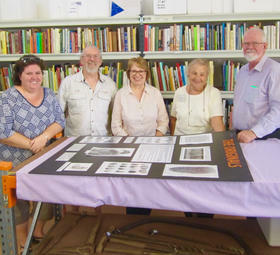 Early maps and plans will help show how six pioneering families made Ginninderra home—before it was all taken from them! Learn more about the Shumacks of Springvale, the Kilbys of Lands End, the Southwells of Brooklands andParkwood, the Camerons and Gribbles of The Glebe, and the Hatches of Rosewood. The stories of these settler families are well illustrated with photographs, maps and plans. The two villages are Ginninderra and Hall. 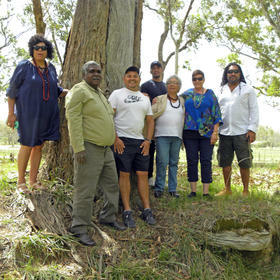 'Ginin-ginin-derry' was an aboriginal locality first traversed by Europeans in the early 1820's and first settled by them around 1826, at ‘Palmerville’. From the 1860's for half a century Ginninderra flourished having its heyday in the 1890’s and early years of the new century when there was a church, school, post and telegraph office, blacksmith shop, police station, store, a nursery, and a boot-maker, Farmers Union, School of Arts, cricket club, and the large Ginninderra Estate. A very productive agricultural area, Ginninderra supplied grain to the Araluen and Majors Creek goldfields, then wool to the Sydney markets. William Davis, then Tom Gribble, Edmund Rolfe, 'Babe' Curran and others helped build a fine reputation for agriculture. When Canberra was selected as the site for the capital and the new Federal government began resuming the land, Ginninderra’s days were numbered. A site for a new village nearby had been selected in 1882, and Hall was set to grow into the kind of village that Ginninderra never quite became. This exhibition, marking the centenary of the end of the Great War, supplements our 2015 exhibition When Hall Answered The Call. That exhibition traced the impact of the conflict on a small bush community. Armistice and After records the participation of the Hall district diggers in the triumphs of 1918 and the euphoria that accompanied the end of hostilities. It also records the difficulties of repatriation and adjustment to civilian life in a world where the promises of peace and prosperity never quite materialized. Finally, it records the veterans’ response after it became apparent that they and their children were being asked to do it all again. Australians are justly proud that as a nation of peace-loving civilians we fought and helped defeat militarism in the two greatest wars the world has yet seen. At the outset the British Empire’s comparatively small professional military forces were outnumbered by the enemy - then swamped by their own civilians. The recruits however were largely dependent on the professionals for leadership and instruction in the craft of war. That was particularly important in the naval war and it is instructive to contrast the experiences of the Crace brothers of ‘Gungahleen’, the one a professional at sea and the other a volunteer on land. They had very different wars - as you can discover in the exhibition. 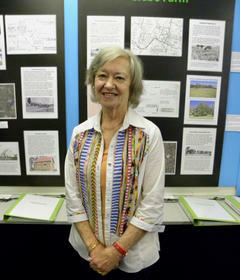 ANZAC Exhibition: 'When Hall Answered the Call'- still open. 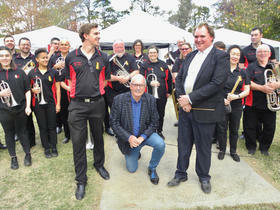 ‘When Hall Answered the Call’ commemorates the centenary of ANZAC. Local soldiers’ histories are fitted into the context of the Great War. Their stories are displayed together with photographs and memorabilia. 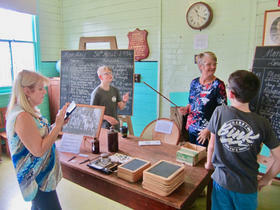 A special feature of the exhibition is a re-created setting of a Welcome Home ceremony that was held in the local Kinlyside Hall at the end of the war. The exhibition pays special attention to the district’s several Rolls of Honour, all unofficial local initiatives by civic, school, church and sporting groups. It also features stories from the Hall home front where families gathered together for mutual support in the absence of their menfolk. A local Red Cross Branch was formed where comfort parcels were assembled and socks hand-knitted and sent to the troops. There is also now a fine publication derived from the exhibition - authored and edited by the exhibition's curator Allen Mawer. 'When Hall Answered the Call' is available from the Centre. This site has two major on-line displays. The first tells the stories of more than seventy one-teacher bush schools of the Canberra region. A second display 'Rediscovering Ginninderra' enables exploration of prominent people and places in the Ginninderra district. Comment and contributions warmly welcomed. On this site you can also learn about the origins and development of the Centre, find out about the Friends of Hall School Museum and Heritage Centre and how to join, and see the latest news and photographs about our activities. You will also find a selection of links to other sites that may be of interest to you, and a 'document register' from where you can download various documents concerning the Museum. You can go to the main Hall Community website at any time by selecting the 'Hall Website' icon.